Boston Landmarks Orchestra hosted the Wednesday night festivities on the Esplanade. Picture a classical music concert stage spilling over with musicians of every ethnicity. Picture an audience with equal representation across the hair-color spectrum – not especially heavy on gray. Such was the inclusive, joyous season-opener of Boston Landmarks Orchestra’s free summer series at the DCR Hatch Memorial Shell Wednesday. “We finally made it, a week later, on a perfect night,” declared music director Christopher Wilkins from the podium, referring to last week’s scheduled starter bring canceled by weather. For this program — Fiesta Sinfónica, an exploration of Latin music and dance — Landmarks was joined by the Dudamel Orchestra of the Conservatory Lab Charter School; students from Horace Mann School for the Deaf and Hard of Hearing and Boston Public Schools; and Boys & Girls Clubs of Boston’s Yawkey Club of Roxbury. It was a very full stage. Leading off the concert was George Gershwin’s “Cuban Overture.’’ It’s a lush piece, with claves and maracas punctuating the composer’s trademark bluesy licks, and the musicians delivered it with a blast of heat. The Dudamel Orchestra alone performed an arrangement of the 1950s hit “Zombie Jamboree,” by Winston O’Connor. The piece is tricky rhythmically, but under guidance of Christopher Schroeder, the young musicians managed to nail it. All performers were back for “La noche de los Mayas” (“The Night of the Mayas”) by Silvestre Revueltas, written as a 1939 film score. The composition employs an array of intriguing instruments including conch shells and traditional drums to create hypnotic tapping, scraping, haunting sounds as the piece hurtles along, though the outdoor acoustics frustratingly muddied the mix at times. After intermission the heat kicked up, fueled by Alex Alvear and his powerhouse salsa stars. Landmarks sizzled through David Amram’s “En memoria de Chano Pozo” — inspired by the storied Cuban percussionist of the title and his most famous associate, Dizzy Gillespie — and Gonzalo Grau’s “Viaje” (Voyage) Afro-Caribbean Suite. Bajucol, a Colombian folkloric youth dance company in Boston led by Miguel Vargas, performed in traditional dress to give visual form to the music. 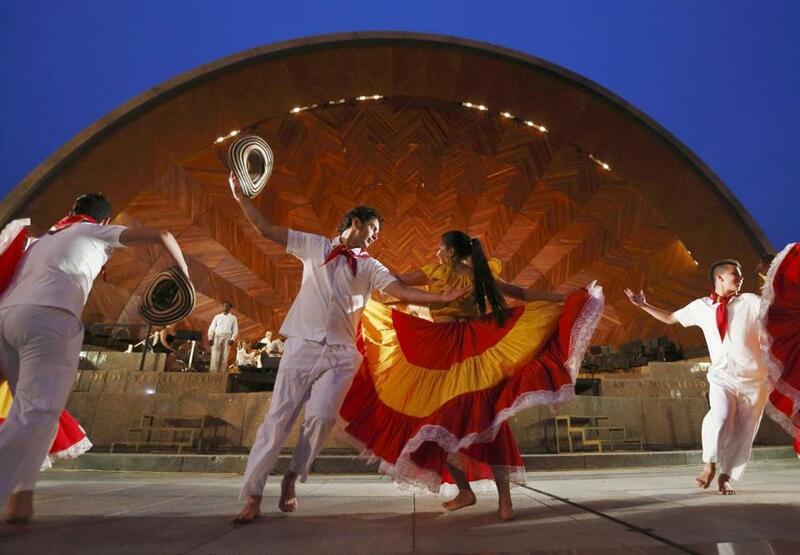 Landmarks Hatch Shell concerts continue Wednesdays through Aug. 27. Thomasine Berg can be reached at berg.thomasine@gmail.com. Correction: A wrong name was given for the conductor of “Zombie Jamboree” in an earlier version of this review.